Lawyers representing the students, who had all enrolled in the fake 'University of Farmington', say they are being held in 'pathetic and dangerous' conditions. 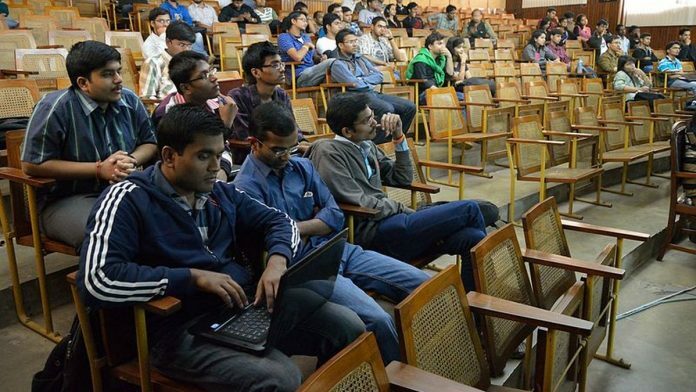 New Delhi: A majority of the 600 Indian students, facing deportation from the US and the threat of imprisonment for having enrolled into the fictitious ‘University of Farmington’, already had master’s degrees from American colleges and had entered the country legally. The students, who also face a ban on entering the US for allegedly overstaying their visas, had all enrolled at the fake university in Michigan, which according to the US Immigration and Customs Enforcement (ICE), had been set up to crack down on immigration fraud. Lawyers representing the students, however, said the Indian students had entered the US on the F1 visa and were working under two programmes — Optional Practical Training (OPT) and Curricular Practical Training (CPT). The OPT and CPT are temporary authorisations that allow students under the F1 status to work in their related fields for a limited period. The trouble began for the students on 31 January, when the ICE’s Homeland Security Investigations arrested eight student recruiters from Detroit, Florida and Virginia. The ICE said they were arrested for “conspiracy to commit visa fraud and harbouring aliens for profit”. The action was part of an undercover operation — Paper Chase — under which the authorities had set up the fictitious ‘University of Farmington’ and recruited a large number of students. This eventually led to the arrest of around 600 students — hailing mostly from Andhra Pradesh and Telangana — across the US. Of these, 130 students were detained and put into detention or immigration centres while the rest are mostly out on bail. They are all facing civil charges across various detention and immigration centres in the US. Sreedhar NagiReddi, an IT professional based in Virginia for the last 20 years, said one of the students was arrested just hours before he was to board a flight back to India realising that he was falsely implicated and that he got enrolled into a fake university. He was handcuffed, his legs tied as he was “dragged” and put into a detention centre, NagiReddi alleged. Lucas Garritson, an immigration attorney based in Texas, told ThePrint that the students are “innocent” and now living a “pathetic and dangerous life in the US”. Garritson added that several girls are among those detained and are being held in immigration centres with child-abusers, drug-dealers and human traffickers. The US State Department has claimed that the students, who they believe were a part of an alleged “pay-and-stay” racket, were well aware that the college was fictitious as it did not hold classes. Garritson also alluded to the fact that in 2016, the United States Citizenship and Immigration Services (USCIS) had run a similar sting operation and caught off-guard, international students waiting for their H1B visas. But the scale of arrest at that time was much smaller and so had gone unnoticed, he said. Ashok Babu Kolla, an active Indian volunteer based in Cleveland, Ohio, said the challenge for the community right now is to get all these 130 students out of the detention centres and deported to India. These students have been in the detention centres for the last 11 days. Kolla, however, highlighted that all Telugu organisations in the US, are now planning to file a lawsuit against the USCIS for “entrapping the student and setting up sham schools”. A group of total 10-12 attorneys are now working on the case as the students are spread across various detention centres in Georgia, Virginia, Florida, Texas and Pennsylvania. According to Garritson, the students can now be deported with a limited three-five year ban but even then, they have to be first produced before a judge, which, he added, can take anywhere between six months to two years as the immigration courts are severely backlogged. He also said that state governments and the Indian Embassy in the US need to step up their role and assist in bringing the students back.